Greenville Teeth Whitening - Dr. William W. Brown, Jr.
With teeth whitening, what we do here in the office is a process where we get impressions of your teeth, so we have models of your teeth, and we make trays that are custom fit to your teeth. And you actually put the bleaching material, which is a peroxide gel, you put that in the trays either during the day or at night depending on the product that we’re using, and you do that over the course of two, two and a half weeks. For most people, if they go through the whole kit for the teeth whitening, most people get to where they’re probably going to get on whitening. There are folks that have some significant coloration of teeth, tech recycling staining, a lot of darker color, and there are some folks that benefit from doing whitening for a longer period of time too, and we can add extra whitening to the process, extra bleaching solution. That’s the process we use in the office. Years ago, we did some in office bleaching with a light, and a high power bleaching solution, and it took a lot of time you sitting in the chair with some fairly caustic items in your mouth and I was never happy with the result. We ended up making trays for patients and sending them home with them anyways, so it cost a lot more. I wasn’t thrilled with the results so we’ve quit doing that. There are some offices that do an hour in office bleaching and some patients like that, I just don’t think it gives us the result we want. The other option on bleaching are the over the counter products. I usually don’t discourage people from using that if they’d like to, I just tell them if you notice some sensitivity, lay off it. Avoid it if it’s causing sensitivity. Typically, the trays that we make, you’re going to get the best change over the over the counter products that are available. One thing with whitening too, it lightens the enamel, it lightens the teeth, it won’t change the color of fillings, the color of crowns; so anyone who has fillings that show on the front teeth, they just need to be aware of, it’s quite possible that they may need changed once the whitening is done because they’re going to be too dark. A healthy, white smile is important to professional and social success. If your teeth are discolored or could use a little touchup, professional teeth whitening is the way to go. Unlike do-it-yourself whitening, whitening at Brown Dental Associates is quick, safe and effective. How white your teeth gets depends on your natural tooth color, but most people see dramatic results quickly. Safety. There’s always a safety risk when using DIY whitening products. You can use too much peroxide and burn your mouth or leave the peroxide on for too long. With custom trays from your dentist, you’re getting teeth whitening guidance from a professional. Dr. Brown will also choose the right concentration for the results you want. Faster results. DIY whitening strips, gels and pastes take forever to work because the concentration of peroxide is just too low. Your Greenville, SC dentist uses professional-strength whitening products to achieve dramatic results in less time. Custom whitening. DIY whitening is one-size-fits-all and doesn’t take into account the condition of your teeth and your natural tooth color. At Brown Dental Associates, your dentist will fine-tune the bleach concentration to fit your needs. The application trays are also custom fit to provide maximum comfort and better, safer and faster results. * Minimize the amount of bleach that can reach and potentially irritate the gums. Get stunning, professional teeth whitening results at your convenience! 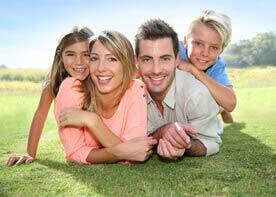 Talk to your dentist in Greenville, SC today to find out more about teeth whitening. Call 864-408-8873 now or use our click here to reqeust an appointment.